At Oaklands Tree Care, We provide a comprehensive range of services that include all your tree surgery requirements throughout London, Dartford, Bromley, Kent and surrounding areas. We guarantee a reliable service with a quick response to every call. 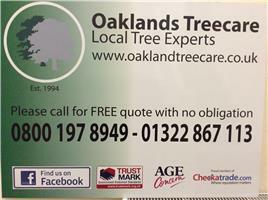 Over the last 20 years Oaklands Treecare has built a large number of home-owners which constantly use us several times a year, as we provide a prompt service and a very good standard of work with a reasonable price. Our staff provides a tidy and professional service to both domestic households and commercial clients. No job is too big or small. We maintain our high standards throughout our staff. We train all our staff in all aspects of the industry and offer vast amount of experience in all aspects of tree care. We maintain high safety regulations while working, so the whole process is carried out with minimum danger. We carry out all aspect of your job according to set procedures with the safety of our employees and customers being of paramount importance.